Wow, how time flies when you are busy! I had hoped to post here more often during the writing of my new book, but between writing, trying to fix a nagging sciatica problem and the day-to-day stuff of life, I find myself flopping into bed every night wondering where the minutes have gone and how I haven't managed to do half the things I meant to do during the day. And while today is another day in which I should be working, I have missed connecting with my friends in the Lyme disease community and so am giving up an hour or two of my time today to re-connect with my blog readers and share a few things that I have learned lately. First, I just want to mention that I am pleased with the insights that I have gained as a result of the research I have done for my new book. 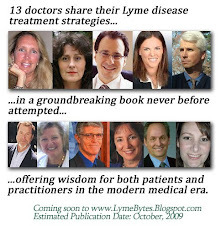 Yes, those of us who read Lyme blogs and visit the Lyme groups know a ton about this illness, but in my investigations, I have become more aware of the gaps in knowledge that I have about treating Lyme, and how much more I still need to learn. Fortunately, this work is filling some of those gaps and providing me with a broader perspective of what it means to truly treat Lyme appropriately, and anyone who researches this disease knows that as long as you are learning new things, your view of Lyme and how to heal it will be ever-changing. Because of this, I am excited to share what I have learned, and my hope is to complete the first draft of this work by the end of April, with all revisions being completed soon thereafter. 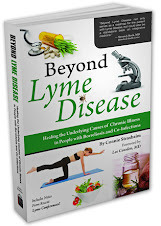 Since things change so quickly in the world of Lyme and information becomes quickly outdated, I am working to finish the book as soon as possible, in order to provide a relevant, worthwhile product to my readers. In order to do this, I have had to put many other obligations aside--including my own treatment of Lyme disease. Yes, I'm still choking down herbs and supplements, but I'm not going at it full throttle so that I can finish this thing. Well, with the exception of treating my back pain, which continues to scream for my undivided attention. Those of you who read this blog regularly know that I've been whining about my sciatica problem since December. Over the past four months or so, I have attempted a number of treatments to quell the raging pain in my hips, lower back and legs, but so far no treatment has been miraculous. The genius osteopath I mentioned in a previous blog post managed to manipulate my ligaments enough so that I can now tolerate sitting in a chair and write my book, but having a body like a jellyfish has meant that all attempts to manipulate my skeleton or ligaments so that I hold my frame like a proper human being have produced only so-so results. You see, those of us with chronic illness (I am becoming more reticent to say Lyme these days, as for many of us with disease, Lyme is only part of the picture), have three things working against us when it comes to trying to keep the spine in place and back pain at bay; inflammation, ligament laxity (due perhaps in part to adrenal insufficiency), and cartilaginous tissue damage due to Lyme. Chiropractic and other manipulative techniques are limited in their ability to relieve the pain of Lyme sufferers, for these reasons and probably others. In my journey trying to heal my back pain, however, I have stumbled upon a few nuggets of knowledge, which I share here. First, most with chronic illness are deficient in vitamin B-12, which causes the sciatica nerve to be like a string of spaghetti that can rub against bulging disks and cause pain. Taking B-12, and especially via intramuscular injections (because it is so difficult to absorb, B-12 is best taken this way), strengthens the sciatica nerve so that it becomes like a cable that doesn't lean this way and that. Also, B-12 assists in nerve conduction, which can help to relieve a variety of other neurological Lyme symptoms. So since I've learned this, I have been bruising my arse with B-12 injections, with the hope that this will, at some point, relieve some of the pain. If you are deficient in B-12 (and unless you have been supplementing, I am willing to bet that many of you are, because it is the most common vitamin deficiency), you should know also that a few injections of the vitamin are unlikely to correct the problem. At least several months of injections, taken 3-4 times a week, are important. Fortunately for me, here in Costa Rica, injectable vitamin B-12 is cheap and can be purchased at any pharmacy. The other thing I have learned in my quest for back health, is that due to the jellyfish nature of my ligaments, reducing inflammation is probably the most important thing that I can do to reduce my back pain. Of course, keeping the skeleton in as much structural order as possible is still important, and while attempting to do so is somewhat akin to climbing a slope of shifting sand, if you can walk around as a kinda-sorta jellyfish instead of a monster jellyfish, that's always better. For me, this has meant investing in a decent office chair and maintaining posture like a soldier whenever I work, as well as doing exercises with a towel to even out my legs when one becomes two inches longer than the other. The exercise is an excellent manipulative technique that the osteopath here in Costa Rica taught me, and helps to keep my back pain at bay. And about that inflammation...Well, obviously, I have found that eating a proper diet and taking antioxidants is important. Enzymes have also proven to be helpful. In addition, this week I will be visiting a neurosurgeon, who will determine whether ozone injections into my spine and surrounding muscles is an appropriate therapy for me. Ozone injections powerfully reduce inflammation in disks and back muscles, and in the case of sciatica, they can reduce disk volume so that the disks shrink and stop rubbing against the sciatica nerve, thereby relieving pain. My research into this technique has taught me that it is safer and more effective than surgery, but I'm not keen on being given an anesthetic cocktail for the first of my six injections. For those who like the idea of ozone for back pain, there are practitioners who do this procedure by injecting ozone only into the muscles, which doesn't require anesthetic (at least not general anesthetic), and is hence less risky, but results may be not as dramatic and more sessions are required. It isn't a cheap procedure in the United States; indeed, I believe that the Mayo clinic charges something like 5K to do the job and I'm not sure how much of that is covered by insurance. Here in Costa Rica, it costs $1,500, which makes it a little more viable for those on a tight budget. If you have sciatica pain or other conditions as a result of Lyme, consider treatment abroad for some of these conditions. It can be less expensive, even with travel costs included, than seeking help in the United States. At least, I am finding that to be true. Don't assume (as I stupidly used to) that the quality of health care in less developed nations is lesser than that of the United States. In some cases, it is better. At the same time, I recognize that underdeveloped nations have fewer resources than the United States, so it depends on the condition for which you are being treated, too. That said, Costa Rica isn't the best place to treat Lyme disease because doctors here don't know anything about it, and since I have come to a plateau in my healing journey, I realize that it will be difficult to keep treating this thing unless I move back to the United States. Research into my new book has shifted my opinion about healing, and I'm starting to believe again that remission from chronic illness requires a lot of dough and access to the best resources and medical care. Indeed, as one of my Lyme-literate physician friends said to me the other day, "This is a disease for the rich." So pending my completion of this book and tying up some loose ends here in Costa Rica, I will be moving back to Denver in late spring to try to get the care that I really need now. Yes, Costa Rica has been healing for me. I am leaving this place much healthier and stronger than when I came in November 2007, due in part to being able to live a more sane pace of life, in the absence of relational conflict and other factors that have conspired against my wellness. I have grown closer to God, because I have had more time to spend with my creator, and this has likewise been beneficial. On the flip side, however, trying to shlep six months of supplements with me in my suitcase every time I leave the States has left me limited in what I can do to treat myself, and access to organic food, which I feel is important for healing, has been hard to find. Some people have asked me, "Isn't food in Costa Rica fresher and less contaminated than in the States?" No, my friends, antibiotics, pesticides and all that other garbage are used here, too, and genetic engineering of food crops is becoming more prevalent. Sure, Costa Rica abounds in fresh fruit, but the veggies? Nope, if they are organic, they actually look nicer in the United States. I admit, leaving this place is a little scary for me, because in doing so, it means that I will have to start life over again in the United States, and attempt to work full-time, and I'm not sure my body is ready for that. In fact, I know it isn't, but my options have now been narrowed down to: 1) Work, and be able to pay for proper treatment for my symptoms; or 2) Don't work, and accept a life of limited functionality. I think the risk of moving back into a chaotic society and an even more chaotic economy is worth the possibility of gaining greater health over the long haul (and supposing I maintain a keen awareness of my body). Working may cause me to relapse, but it may also provide the funds I need to treat this properly and really kick it. In making such a decision, I have had to examine my heart and ask myself the question of whether I feel I am truly worthy of being healthy. Because if I am, then I have to give this all that I've got; I have to believe that there's a way and that if I persist, I will find that way, even though it might just be easier to accept a life of limited functionality here in Costa Rica. Two years ago, working wasn't even an option for me and I had to rely on charity. Some of you are still in that place. But whether you are or aren't, and you fear not being able to treat Lyme because of limited resources, I encourage you to ask yourself the question about whether you feel you are deserving of health. Because sometimes, we limit ourselves in our options because there is something deep within us that says, "You don't deserve to be well," and we will subconsciously sabotage our healing that way, and not do treatments that could help us. We will find excuses aplenty and reasons why health is out of reach for us, and financial hardship may be one of these. Yes, it's a legitimate roadblock to wellness, but if you don't have the money, before you give up and decide that it would just be easier to languish on your sofa for eternity, do some soul-searching, and ask yourself whether you really can't ask your best friend for a few bucks; whether there really isn't a prescription drug plan out there to help you with your medical costs, or whether there might be a way to earn a few bucks selling used books on E-bay. Make no mistake; the belief that you aren't worthy of health can disguise itself in rational excuses, but sometimes, you have to look at those rational excuses and become radical in your thinking, if you want to get better. Healing from chronic illness, and especially Lyme, is supremely difficult. To rise to the occasion, we must believe we are worthy of wellness, take risks and think beyond the box of our very real, and profound, limitations. Some of us are in an abyss, at the bottom of a dark well and without the help of family, friends, doctors and insurance companies, the way out of this well, or abyss, feels impossible. Indeed, we live on the edge of impossibility, and only by asking for God's help and reaching beyond in our thinking and challenging its limitations, will some of us be able to climb out of that well. At least, I feel that this is true for me, and if you are one of those who is stuck inside the well, I hope that my new book will provide even more rungs for you to climb up on, that you may one day see the light of day again. It is good to read your postings once again, Connie. Sounds like you are keeping very busy and finding what you need to move forward. I am looking forward to reading your next book. thanks for this update, connie. i appreciate so much you sharing your wisdom gained through the labyrinthine journey that is lyme. your words about internal blockages to healing ring so true for me. i'm currently trying to open myself up to the universe and creator in my quest to figure out which steps to take next. it's hard, harder than it sounds, for some reason. do you think you'll be working with an LLMD once you return to the states? will you go back on abx? these are questions i'm trying to answer for myself, and i know no one can answer them but me, but it's helpful to reach out to other alternative/holistic-minded lyme patients and see what their thoughts are, as well. anyway, take good care. many many blessings your way. As for me, I am not sure exactly what I will be doing when I go back to the States. A friend is trying to raise some money for me so that I have more options. I think that my book, if you choose to read it, may help to answer the question regarding which therapy might be right for you. I think I may visit an LLMD, but more for my hormonal issues. I have a few ideas about what I will do for the infections, but haven't settled upon one yet. Anyway, I don't think the infections are primary for me, so for me this aspect is less important than trying to get my immune system to function properly again. I may at some point do antibiotics, but I am still reticent to go that route. I would rather exhaust all other options first, though I know that they can be a great option for some. I hope this helps! I am so glad you are back. To take or not to take Vitamin D. What is your take on it? I think that most with chronic illness are deficient in Vitamin D, and I would definitely recommend taking it. If you can afford the blood test to confirm that you have a deficiency, I would do this first. Lack of vitamin D causes skin cancer! (So that story about staying out of the sun to avoid skin cancer might not have as much merit as we thought). Good luck! I have taken the test and it shows that I am low in D. Dr. Marshall advices against it for Lyme. I am not on his program, but I got confused. Just this past week, I *finally* got a blood test result (through the highly-regarded IGeneX lab) to confirm my suspicion that my disability is likely being caused by chronic Lyme. Probably got infected about 15yrs ago, but didn't even suspect neuro-Lyme until a progressive-thinking MD raised the question to me about 9mo ago (that's how long it takes to jump through the medical hoops - I'm on disability/Medicare). Tomorrow, I will have a visit from my home health doctor. To his credit, he has admitted that he knows very little about Lyme, other than to say it can be knocked out easily with antibiotics. Pretty naive, huh? Did you ever try an IV of Vitamin C? 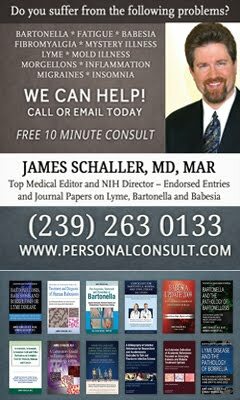 A doctor near LA, Dr. Julian Whitaker [drwhitaker.com], claims to have had great success with this approach when treating Lyme. I hope to avoid taking pills, and want to try Vitamin C IVs.